Absolutely No. The chemicals called Pheromones in the sweat do not have to be consciously perceived to affect the recipient, but have been shown to affect our behavior when used at subconscious levels. Humans, like other animals also release pheromones from the body, but its quantity is less significant since it has no relevance in communication. In the course of evolution, humans have lost the ability to detect and respond to pheromone consciously. 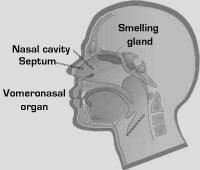 But researchers say that perception to pheromones is still in our brain but at the subconscious level. At an instinctive level, the pheromones dictate our interaction with other humans. Researchers say that the Andropenes significantly influence the Aggressive behaviour, Sociability, masculinity, affection etc of males. Likewise the Copulins of females can influence the brain of males to alter the behaviour. But We human beings are highly hygienic, so that our pheromones are the victims of daily bath. Use of perfumes, deodorants, body sprays etc also kill our pheromones so they cannot do anything in our daily life. Let us see some unbelievable but interesting findings.